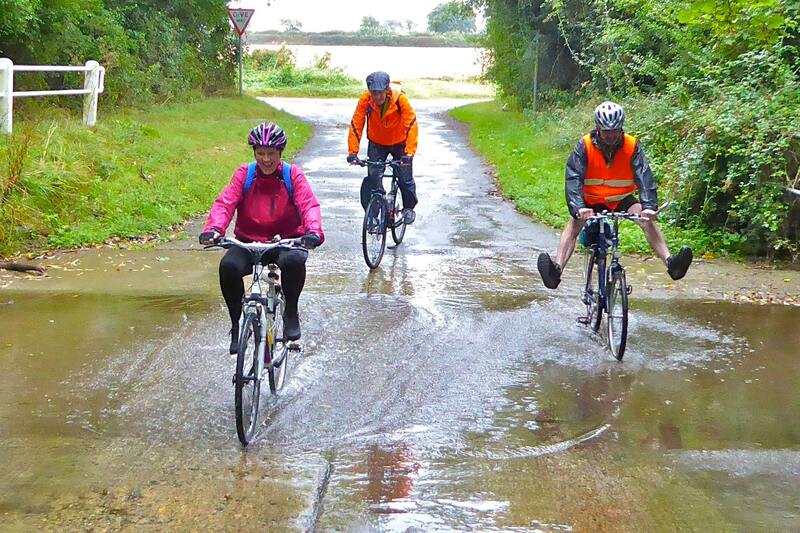 Although not a bell ringing activity in itself the fact that four of the Scarning band, plus a non-ringing friend, took part in the 2016 Norfolk Churches Trust ‘Bike Ride and Walk’ day is worth recording. 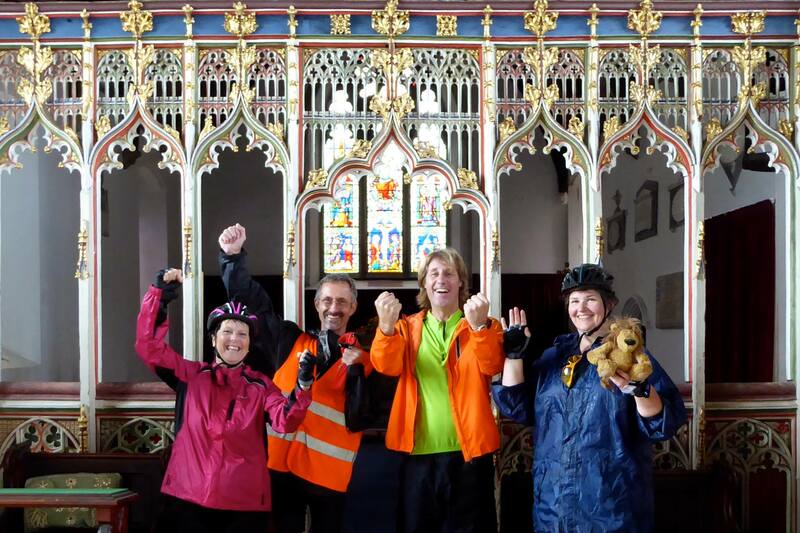 We chose to cycle (as most people do) and visited all the churches in the Dereham group, apart from East Bilney, plus Westfield, Gressenhall and Beetley Methodist chapel, which were conveniently en route. A total of eleven churches. The money raised by this annual event is split between the Norfolk Churches Trust and your particular church of choice; naturally we elected for our 50% to go to Scarning. Unfortunately for us the appointed day was the only wet one in a period of very settled weather. Not just that but it rained steadily from start to finish. However, as Sian said, ‘You can only get wet once’, which has a certain logic to it, and after we were all wet through it didn’t seem to matter any more. 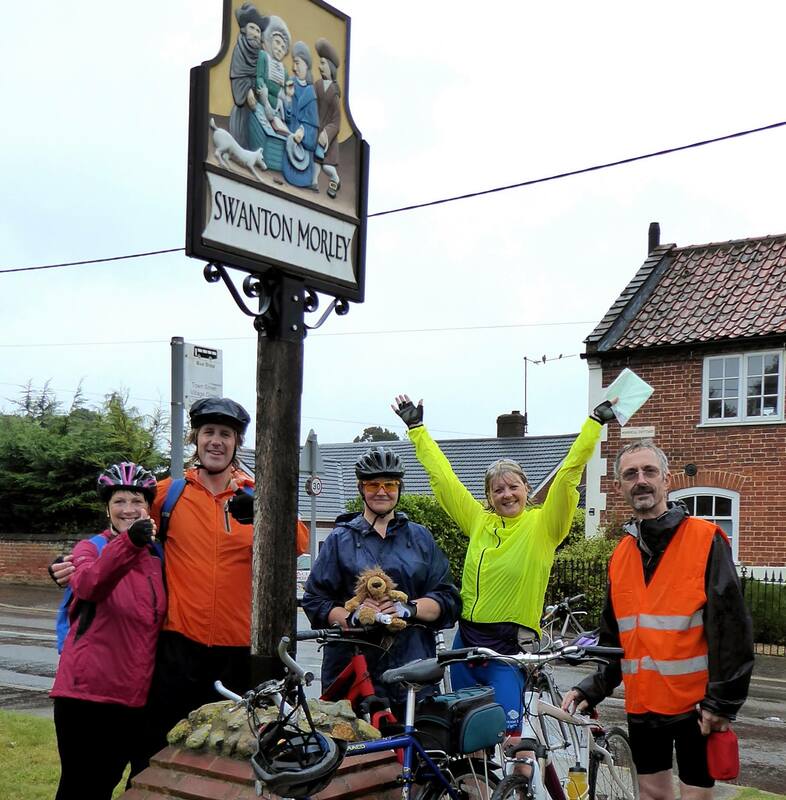 After visiting West and East Bradenham, Shipdham, Westfield and Dereham the next stop was Swanton Morley. There was a wedding taking place here during the afternoon and rather than have dripping wet cyclists traipsing in and out of the church a gazebo had been set up on the playground and we were intercepted to do our signing in. In spite of being wet through we were in high spirits and felt sorry for the people sitting in the gazebo, who seemed to have got a worse deal than us. As it happens one of our band, Fiona, rang for the wedding so we heard all about it afterwards (it was a rather grand affair). Almost there; the ford at Podmore. After calling at Hoe, which was locked, Beetley, where they were happy to see us in spite of another imminent wedding, Beetley Methodist Chapel, where we were made very welcome, and Gresssenhall, we were well on the way back to Scarning. By the time we got to what Scarning people loosely refer to as ‘the river’ at the bottom of Podmore Lane it is fair to say that the constant rain and the distance we had ridden had made us slightly excitable, and in the picture above the tower captain appears to be re-living his far-off childhood. At around this point Abi hit her head hard on an overhanging branch and then picked up a big thorn in her tyre, which it seemed sensible to leave in rather than pull out. However neither setback seemed to worry her unduly and we pressed on for home. We got back to our final stop, Ss. Peter and Paul Scarning, at 3 pm, having taken five hours to ride 28 miles, including the numerous stops at the churches. We went past all the pubs, which probably wouldn’t have been the case if we had been dry and presentable, and didn’t eat our proposed picnic. 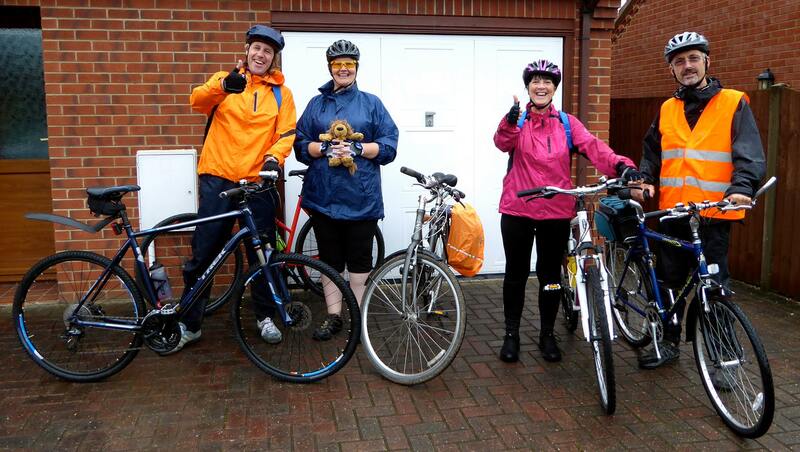 Considering that we did the ride in continuous rain we were rather pleased with ourselves but quite happy to finish. We have promised each other to do it again next year, but we hope with better weather. The four ringers and Lawrence in front of Scarning church’s lovely rood screen. Images kindly supplied by Abigael Polley. All rights reserved.